The West Florida Revolt of 1810 was fought for independence from Spain and the establishment of the free Republic of West Florida. Was the Florida Revolt of 1810 a rebellion or a revolt? It was a proper revolt. The Spanish authority was overthrown by an armed insurrection. 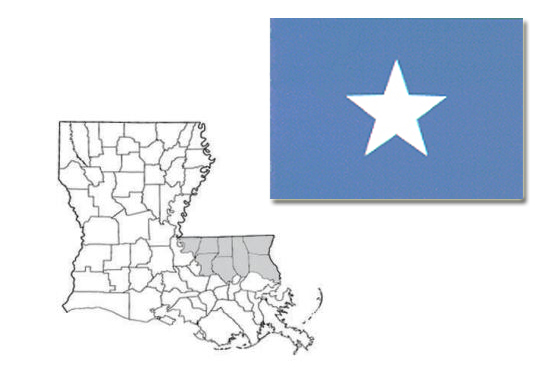 And yes, Louisiana has parishes, not counties. Another legacy from Catholic French and Spanish rule back in the days. Who Exactly Fought in the West Florida Revolt? 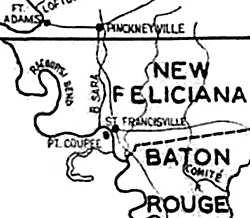 Feliciana county settlers (today's Florida Parishes, then the westernmost part of Spanish West Florida, see map below) fought their Spanish landlords. Among these settlers were many British loyalists and American deserters. The Spanish governor of West Florida at the time was Vicente Folch. The capital of West Florida was Pensacola. The West Florida Revolt was fought from September 23 to October 9, 1810. 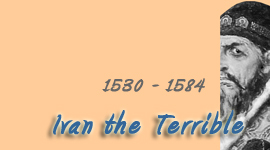 Short term winners of this revolt were the rebels, who enjoyed their independent Republic of West Florida for 74 days. Long term winners of this revolt was a third party, the United States, who took advantage of the commotion and annexed the territory outright. This in turn led to the speculation (now proven) that the uprising had been at least in part encouraged by the American government. Spain lost the Floridas (West and East Florida) in slices. By 1819, it was all gone (see Transcontinental Treaty). The Native Americans meant to send their condolences, but apparently, someone had stolen their letterheads. The Republic of West Florida lasted from September 26 to December 8, 1810. It reached from the Mississippi to the Pearl River, had a flag, an assembly, a governor, governing officials, an army, and a constitution, which, by the way, was pro-slavery but religiously tolerant. You can examine the original copy of the Constitution of the Republic of West Florida, which is housed in the Louisiana State Archives at Baton Rouge. It was placed there in 2002 by Leila Lee Roberts, the great-granddaughter of Fulwar Skipwith. It is amazing how many times in history the root of disagreements can be traced back to a big ego from Corsica. On June 6, 1808, Napoleon placed his brother Joseph Bonaparte on the Spanish throne, which had formerly been occupied by Spanish King Ferdinand VII. To make sure Ferdinand stayed away from the coveted chair, Napoleon locked him up. The people of Spain were shocked and outraged, as were the people in the Spanish colonies. But there, they went a step further. 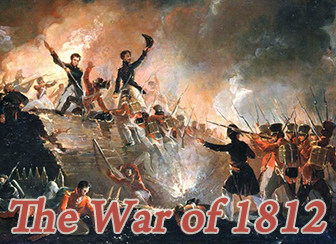 In the colonies, this crisis of authority led to unrest, and the war for independence from Spain gained momentum. The monarchy dissolved and Spain lost — Are we not in the position of children who come of age at the death of the father of the family? Each one enters into the enjoyment of his individual rights, sets up a new hearth, and governs himself. Sir: According to present appearances a crisis is approaching which cannot fail to dissolve the Colonial relation of Spanish America to their parent Country. It is the duty therefore of the United States to turn their attention particularly to the case of the two Floridas in whose destiny they have so near an interest. Besides that which results from Geographical position the United States consider themselves as holding a legal title to the greater part of West Florida under the purchase made by the Convention with France in the year 1803. And they have a fair claim of another kind, which would certainly not be more than satisfied by the acquisition of the residue of the West and the whole of East Florida. 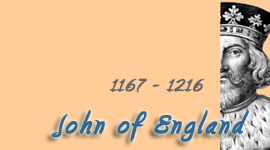 Under these circumstances it may be proper not to conceal from the British Government (which may otherwise form views towards these territories inconsistent with the eventual ones entertained by the United States) that any steps on the part of Great Britain interfering with these will necessarily be regarded as unjust and unfriendly, and as leading to collisions, which it must be the interest of both nations to avoid. This instruction from the President is given to you on the supposition that the connection of Great Britain with Spain will have been terminated by events in Europe. You will of course forbear to execute it in a different state of things. And in executing it you will be careful to authorize no inference with respect to the intentions of this Government inconsistent with the principles of justice and neutrality on which the policy of the United States is founded. [...] You know, that under the Louisiana Convention, we claim as far eastwardly as the Perdido. That claim never has, and never will I trust, be abandoned. But I am persuaded under present circumstances, it would be more pleasing that the taking possession of the country, be preceded by a request from the inhabitants. Can no means be devised to obtain such request? The time may arrive, perhaps it has arrived, when the people of Florida must adopt measures with a view of their present and future security. [...] to form for themselves an independent government is out of the question! [...] Nature has decreed the union of Florida with the United States, and the welfare of the inhabitants imperiously demands it. [...] and therefore it is, that I, with the more confidence, invite you to lose no time in sounding the views of the most influential of your neighbors on the opposite shore, and in giving to them a right direction. [...] Impress upon their minds the importance of the crisis, the expediency of scouting everything like French or English influence, and assure them, I pray you, of the friendly disposition of the American government. Historians have difficulties to ascertain to what extent the U.S. government managed to encourage the West Florida revolt, and to what extent it evolved naturally. Fact is that the American stance that "an independent government" was "out of the question" was not shared by all rebels. A group of West Floridian planters are unhappy with their Spanish government in general and their governor Don Carlos de Hault de Lassus (also spelled Carlos Dehault Delassus) in particular. Today, they voted fourteen men as their representatives who will assemble as a convention with the goal to aid the governor in his duties. De Lassus never asked for any help, but he doesn't have the manpower to put the settlers in their place in case they wouldn't take no for an answer. So this election of a convention took place with his permission in order to buy time. 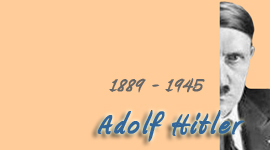 He secretly sent for armed help from Vincente Folch to restore his authority. The Convention meets at St. Johns Plains near Baton Rouge. After pledging allegiance to Spanish King Ferdinand VII, they list their goals and grievances. After weeks of deliberation, the Convention passed today their resolutions as an ordinance for future implementation, all in all 32 pages long, with only one dissenting vote. Governor De Lassus also added his signature. All seems well. One of Delassus' letters to Folch, in which he asks for immediate help to suppress this assault on his authority, is intercepted by convention supporters. The Convention now has proof of Delassus' double dealing. The Convention meets at St. Francisville. 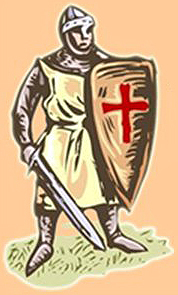 Delassus is condemned as a traitor. The men realize that if anything needs to be done, it should be done quickly before Folch's troops arrive from Pensacola. Philemon Thomas, commander of the local militia, is put in charge of capturing the Spanish Fort San Carlos (formerly British Fort Richmond) at Baton Rouge in the name of the Convention. Shortly before 4 AM, approx. 75 armed rebels led by Philemon Thomas, colonel of the militia, storm the Spanish fort at Baton Rouge. They capture the fort quickly, disarm the defending Spaniards (including Governor De Lassus) and raise their flag. The Convention dispatches Edmund Hawes to talk to the inhabitants of the St. Helena and St. Ferdinand district, who were not on board with the revolution. In fact, there, the majority of residents were pro-Spanish, and these forces organized themselves to strike back. The Convention assembles at Baton Rouge and declares West Florida to be free and independent from Spain. The Convention asks all planters to send slaves to assist in repairs on the fort. The Convention charges Philemon Thomas with the task to quell any potential counter-insurrection in the pro-Spanish St Helena district. Thomas and about 400 men cross the Amite River. Some of the pro-Spanish individuals sign the Declaration of Independence, others flee to New Orleans. The Convention puts Reuben Kemper and Joseph White at the head of the new Convention Army. Their task is to advance against Mobile, Alabama, and thus to extend their territory to the Perdido River. 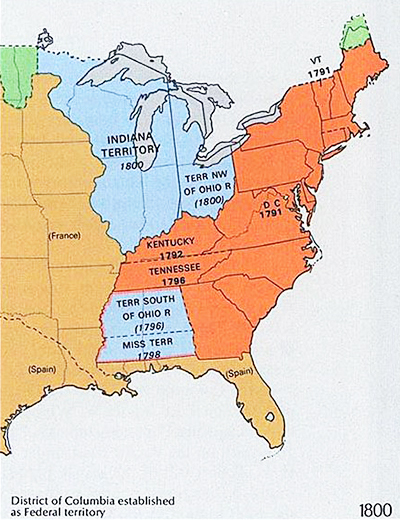 President Madison issues a proclamation annexing West Florida, from the Mississippi not only to the Pearl River, but all the way to the Perdido River, stating that this is U.S. territory because it had been part of the Louisiana Purchase of 1803 all along. William C.C. Claiborne, Governor of the Territory of Orleans, is dispatched to see this through. Thus, the West Florida Revolt of 1810 got mixed up in the West Florida Controversy that exists between the U.S. and Spain. The Convention elects Fulwar Skipwith Governor of State. Claiborne arrives in Natchez. Capt. John Shaw, leading five vessels down the Mississippi, will provide naval support for the impending invasion. Col. Leonard Covington will lead 300 troops from Washington (Mississippi Territory) to Pointe Coupee, located across the Misssissippi River from St. Francisville. There, Covington will meet up with Claiborne. Col. Pike will led the rest of the army in the Mississippi Territory. Claiborne gets intel that Skipwith is gathering his troops. He orders Covington to increase his army to 800 troops. Claiborne writes US secretary of state Robert Smith "you may be assured that no blood will be shed, if it can possibly be avoided." Claiborne orders the American garrison at Fort Stoddart, near Mobile but Mississippi Territory, to be good and ready just in case. He then leaves for Pointe Coupee. The president's proclamation had previously been circulated among the citizens of St. Francisville, and had become the subject of general conversation. Dissatisfaction as to its tenor was expressed by several members of the assembly, and some citizens ; but Mr. Skipwith in particular took great exceptions. Govr. 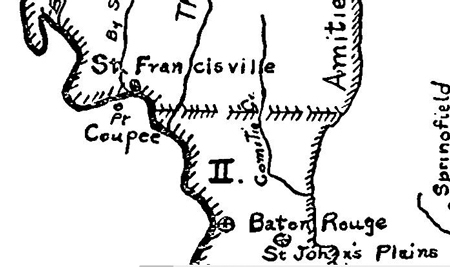 Holmes gave such explanations, as were believed to be satisfactory to most of the former persons; but Mr. Skipwith continued dissatisfied, as in the afternoon of yesterday he returned to Baton Rouge, accompanied by three or four members of the Florida Legislature, where it is understood, the whole corps are to assemble on Tomorrow. Claiborne arrives at Pointe Coupee, where he joins the Governor Holmes, and Audley L. Osborn (a lawyer who will become the first judge of the St. Helena Parish). then said, that Mr. Skipwith had also charged him to inform me verbally, that he had retired to the Fort of Baton Rouge, and rather than surrender the Country unconditionally and without terms, he would with twenty men only, if a greater number could not be procured surround the Flag Staff and die in its defense. To this message I made no reply, but requested Mr. Johnson to repeat it; which he did. Mr. Johnson again took occasion to express his devotion to the Government of the United States, and urged me to visit immediately St. Francisville where I would find a Militia Troop of Cavalry, a company of Riflemen, and a concourse of Citizens, who would welcome my arrival, in the Territory, and with pleasure recognize me as their Governor. Claiborne sends Osborn to assess the actual level of hospitality he would likely encounter in St Francisville. There I saw a pavilion waving which was said to be the Colors of the State of Florida. The Militia being required to form round the flag staff, I appeared in the center, and the president's proclamation being read by a Citizen, I said to the Militia, that having come among them as their Governor and commander in Chief charged by the president of the United States to protect them in the enjoyment of their liberty, property and religion, I had only to observe, that it would be my pride and glory to discharge with fidelity so high a trust. The Florida flag was then ordered by me to be taken down, which was done, the Militia and Citizens cheering (as a mark of respect) as it descended. I then ordered a flag of the United States, which I had. taken from my barge to be reared, which was also done amidst the huzzas of the Militia and citizens. No efforts which my Country's honor or my own permit, will remain unessayed, to induce Mr. Skipwith to abandon his ill-judged and rash purposes : Nor am I without strong hopes of succeeding. But if conciliatory measures should obstinately fail, the troops of the United States will be commanded to take the fort. Claiborne gets ready to move on Baton Rouge, while waiting for Capt. Shaw and his gun boats to arrive at St Francisville. From the information previously received I certainly had reasons to apprehend resistance, and was prepared to meet it. But on landing near the Town the agreeable intelligence was brought me that the armed Citizens (called here the Convention Troops) were ready to retire from the Fort, and to acknowledge the authority of the United States. It was not understood by me that terms were insisted on. But a wish was expressed that the Florida flag might be treated with respect, and the deserters unmolested. In answer I requested that the Fort might be evacuated at half past two o'clock, and that the citizens should march out and stack their arms. As related to the Florida flag I readily assented that on striking it, such evidences of respect might be shown, as the armed citizens in the Fort thought proper. And with regard to the deserters I stated, that they should remain undisturbed until the president's pleasure respecting them should be known. This arrangement was satisfactory, and the Fort being evacuated in the manner and at the time proposed, it was taken possession of at three o'clock by a Detachment of the United States Troops. Spain abandoned her claims on the land strip between the 31st parallel and 32nd 28' with the Treaty of San Lorenzo in 1795. 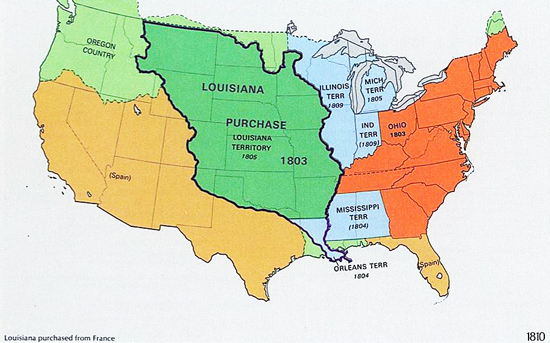 The U.S. made it their Mississippi Territory in 1798. The rest of West Florida is in Spanish hands. West Florida from the Mississippi River to the Perdido River claimed by the U.S. 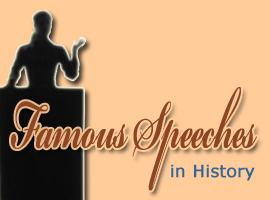 Here is more about the history of West Florida. Here are the men who governed the Republic of West Florida in 1810. And here is the list of all governors of the colonial province of West Florida from 1763 to 1821.